A Utah ER turned into a shooting gallery when a man that was refused treatment returns with two handguns. Police engaged him, shooting him four times. The man, Jason Burr had been taken to the hospital and told he needed immediate surgery. However, he was refused treatment. According to his family, he was in severe pain, panicked and took all the pain pills he had. When I read this story, I thought there were obvious issues (health care crisis, refusal of care to those in need of serious treatment), but also some underlying issues that probably are between the lines. Though Mr. Burr was in severe pain, the glaring issue for me is the problem of prescription drug abuse. Yes, I realize there is an argument to be made that this man was in extreme pain and he needed surgery. So, of course he swallowed the rest of his narcotics. Makes sense right? Then in a drug induced psychosis he went postal of sorts and entered the ER brandishing two firearms. That is – until you consider Jason Burr a little more closely. 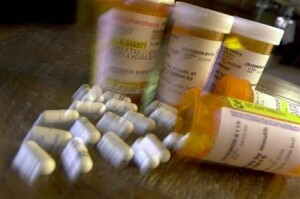 Burr pleaded guilty in August 2010 to falsely obtaining and dispensing prescription drugs, Utah online court records show. He was sentenced to 30 days in jail and put on three years of probation. Mr. Burr falls into an often overlooked category of ticking time bombs. Some people have real pain, but because of irresponsible care and medication management, they become ravenously dependent on narcotic painkillers. This led Burr first to take the somewhat extreme step of acquiring his drugs (meds) illegally…and eventually the most certainly extreme step of taking loaded weapons to the ER after being refused treatment. First the medical care system let him down in how they treated his pain. Then they let him down by refusing him the surgery that could offer him real and lasting relief to his pain. None of this, of course excuses his conduct. But it does make you think: how many more unstable people are being denied healthcare they need, and given healthcare that makes them a greater danger to us all?